• Scratch Resistant Acrylic - High optical grade, hardcoated both sides. • Anti-Reflection and Scratch Resistant High optical grade, abrasion resistant with anti-reflective coating both sides. • Polycarbonate Sheet, Scratch Resistant, Indoor Use - High optical quality hardcoat sheet. • Polycarbonate Sheet, Scratch Resistant, Outdoor Use - High optical quality, hardcoat both sides, UV resistant. • Acrylic Diffusion Sheet - Excellent light transmission. • Anti-Fog - High optical quality acrylic with hard coated both sides. Precision cutting, laser cutting, CNC routing and machining, printing all thermoplastics - your material or ours!. Techplast Coated in New York Welcome to Techplast Coated Products Inc! We supply optical grade (not standard commercial type) acrylic and polycarbonate sheets with unique coatings; scratch resistant, anti-reflection and anti-fog. These products are primarily used in the manufacture of flat panel displays requiring the highest optical and cosmetic quality. Techplast's large inventory allows us to fulfill both small and large requirements for prototype and production quickly and efficiently. 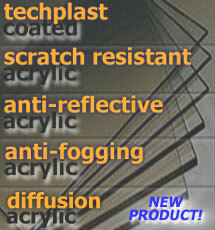 Scratch Resistant: Acrylic and polycarbonate optical grade sheets with hardcoat both sides. Anti Reflective: Scratch resistant optical grade acrylic with anti-reflection coating. Anti-Fog: High optical quality hard coat acrylic with anti-fog coating. Architecture, display, instrumentation, POP display components. NEW Acrylic Diffusion Sheet: Very high light transmission, many applications including backlighting, commercial lighting and signage. Techplast provides precision laser cutting and drilling, CNC routing and precise sawing and cutting and printing of the materials we sell. Using the drawings you provide, we can fabricate small parts to your requirements. You can save time and money by having your parts arrive ready-made to fit into your application. Send a drawing to Techplast. Scratch resistant acrylic sheet in prototyping or production quantities. High Optical Grade - hard-coat, glare-reducing PC. Scratch resistant. Techplast Coated Products, Inc. supplies specialty plastic sheet materials requiring optical quality including scratch resistant acrylic sheet, scratch resistant polycarbonate sheet, anti-reflection acrylic sheet and anti-fog coated sheet. In addition we offer acrylic diffuser sheets for backlighting and signage. Our products are often used in the manufacture of LCD and LED screens for telephone and handheld technologies. 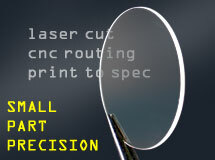 Techplast also provides small part laser cutting and CNC router fabrication of our materials. We inventory continuous process scratch resistant acrylic sheets. IMPORTANT DISCLAIMER: All information provided on this site is for reference. Always perform your own tests and acquire further information to determine product suitability. While we make effort to provide accurate information, we cannot be held responsible for errors of omission or typographical. Techplast Coated Products, Inc. assumes no responsibility for the use or suitability of any product. Popular Links Page · Website designed and deployed by Industrial Advertising, Inc. Copyright © 2019 Techplast Coated Products, Inc.